The Italian capital is an important place for world gastronomy. Eating in quality restaurants in Rome should be an imperative. Unfortunately what is served in the center of the city could be considered an insult to the country's culinary tradition. To really visit Rome, you have to take the bus or walk a bit and discover real Rome restaurants! Italy, Rome, 04 April 2014 - Orange Garden on Aventine Hill, also called Savello Park. This is a night session in HDR mode. ROME, Italy - The Italian capital is an important place for world gastronomy. Eating in quality restaurants in Rome should be an imperative. Unfortunately what is served in the center of the city could be considered an insult to the country's culinary tradition. To really visit Rome, you have to take the bus or walk a bit and discover real Rome restaurants! Rome is host to a three-Michelin-star restaurant. There are only about 100 in the world to have received this distinction. The restaurant of chef Heinz Beck has had its three stars for 10 years now. It's called restaurant La Pergola, and I had the chance to visit it. 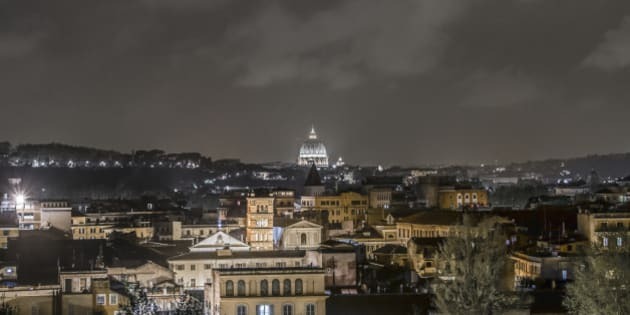 You need a solid wallet, there's a strict dress code, luxurious products are everywhere, and the restaurant offers the most beautiful view of Rome, as it is the highest viewpoint of the city. And the meal is amazing. Click here to read my full review of restaurant la Pergola in Rome. Imago Restaurant is located in a five-star hotel overlooking the "Spanish Steps". It is a highly touristy place, but chef Francesco Apreda offers a meal inspired by Japan and India. And he also has a Michelin star. Again, it's not the cheapest meal, but what an adventure! Click here to read my full review of Imago restaurant in Hassler Hotel Rome. Some people like to go to the museum. Others want to visit the parks. There are some who adore architecture. I like to eat. That's why I loved visiting Eataly in Rome. It is the same concept as the Eataly located in New York, that is to say a kind of Ikea of ​​gastronomy. There is a floor dedicated to kitchen tools and books; Another that offers butcher, fishmonger, fruit shop, grocery store and bakery; Another where desserts, wines, alcohols, cheeses are offered; Then, on the top floor, a full service restaurant, shellfish stands, a microbrewery (which brews its own beer! ), a wine bar, and a chicken restaurant are sitting side by side. In appearance, it is a small ordinary trattoria in the Garbatella neighborhood, but make no mistake: the dishes that are served at Al Ristoro degli Angeli are of superior quality in all points. Homemade pasta, simple and perfect sauces, dishes that are always adapted to the seasons ... It is a Roman trattoria just like the ones found in the romantic dreams of travel buffs! Simply put, this is one of my favorite restaurants in Europe. A young team that is creating a buzz in the city leads Assaje restaurant, located in Hotel Aldrovandi Villa Borghese. I ate a dish of fresh pasta with a sea urchin sauce that I'm never going to forget. The wine cellar is impressive and the real estate that the hotel occupies is simply stunning, on the edge of the Villa Borghese. Having a meal under the stars, by the pool of the hotel, is the kind of setting required to propose to your future wife or husband, nothing less.